a parked area, it required careful consideration of layout and proportioning to obtain good esthetic effect. It was built upon centering which the contractor had used for another structure having smaller spans, and the centers were ingeniously adapted for service under these conditions. Rocky River gorge, seven miles west of the Public Square, Cleveland’s center, has heretofore been crossed by only two bridges. Traffic growth in recent years crowded these to capacity, and the need for a third crossing became imperative. Authorization to built it was obtained late in 1923, a bond issue of $930,000 being voted. The bridge was opened to traffic last December, 19 months after letting the contract. The new crossing is on the line of Hilliard Road, and is 900 ft. long. Deck level is 125 ft. above the valley bottom. For the desired traffic capacity a 56-ft. roadway is provided in a total deck width of 80 ft. The valley is part of the park system of the city of Cleveland. For this reason a three-span design was chosen, the vista through a central arch being considered desirable. The central arch is 220 ft. long center to center of piers, while the two outside arches are 196 ft. each. In order that the bridge might appear lighter, the distance from the grade to the crown or each arch was made as short as possible. 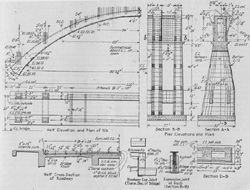 In addition, a sharp batter was used on the piers, to make them narrow at the top but wide enough at the base to withstand unbalanced loading during construction. At each abutment there is an ornamental concrete pylon, through which an arched passage leads to a balcony. This affords a view of the side of the bridge and an extensive prospect of the river below. The roadway has a constant up grade to the east of 0.5 per cent. It is surfaced with brick laid with an asphalt filler. Provision has been made for double street-car tracks by leaving a depression which is temporarily filled with cinder concrete and paved over. 6 ft. wide while the inner ones, which carry the tracks, have a width of 8 ft. Their thickness varies from 9½ ft. at the springing line to 4½ ft. at the crown. The floor of the bridge consists of concrete slab, spanning longitudinally between floorbeams 11 ft. apart. Over the crown of the arches these floorbeams rest upon 2½ ft. longitudinal spandrel walls which have extra reinforcement beneath each panel point, forming virtually a series of posts supporting the floorbeams. At a distance from the arch crown a series of 22-ft. spandrel arches carrying two panels apiece supports the deck. The handrail of Amherst sandstone, is composed of square balusters. This shape, which does not require lathe work, was less expensive than the circular sections and produced a balustrade to harmonize architecturally with the concrete pylons at the abutments. beams separated by an expansion joint are located at the crowns of the first jack arches in front of the abutments and at the crowns of the jack arches over each pier. These arches are split at the center and designed as cantilevers to eliminate the use of sliding surfaces. On the pavement 6x6-in. angles are placed to retain the paving brick. The distance between the upright legs of the angles, which is almost an inch, is flashed with sheet copper to retain the bituminous filler. On the sidewalk the opening is covered with a sheet lead strip fastened to angles built into the slab. The roadway surface is waterproofed by the membrane method. Drainage is taken care of by catchbasins placed at intervals of about 200 ft., discharging to the river through spouts in the piers. The contractor, the Walsh Construction Co. of Cleveland, had previously built a railroad bridge at Sidney, Ohio, 150 miles from Cleveland, and the steel centers used in this construction were still available. They were three-hinged arches built for spans of 170 ft. By the use of auxiliary towers at either end, and wooden framing over the steel the centers were enlarged to fit the longer span and different arch curve of the present job. The ribs were poured in pairs. After one pair had been poured the centers were moved transversely with the aid of jacks until they were in position for the other two ribs. 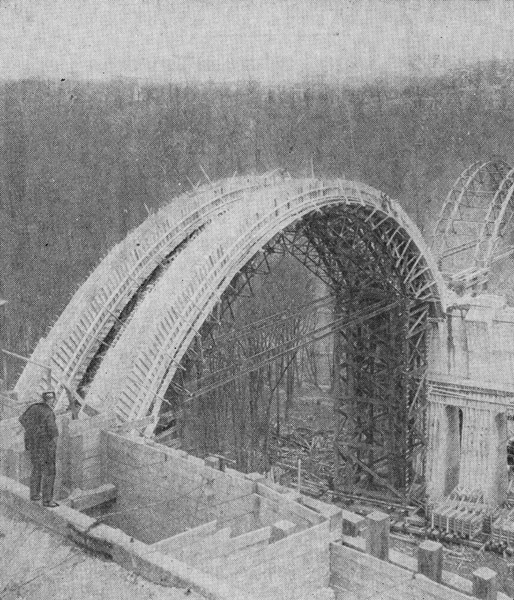 The arch concrete was poured monolithically. 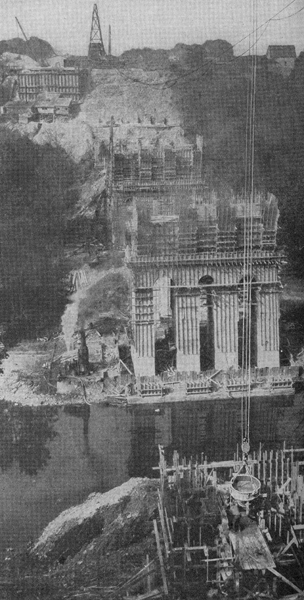 The superstructure was placed by loading all crowns first and then pouring the balance symmetrically to insure minimum distortion of the piers. Careful measurements were taken of the horizontal deflection of the piers at the springing line, and it was found that 5/8 in. was the largest strain causes by the loading system. As the loading became balanced this strain was eliminated and the piers are now within 3/16 in. of their theoretical position. The design of the mixing plant was governed by the source of supply of the raw material. Local conditions and freight delivery made the west bank of the river the logical location for the mixers, and the adoption of a traveling cableway with an 80-ft. travel spanning the 1,200 ft. across the valley, provided a means of delivering materials and erecting the centers and forms. All concrete was mixed by two machines, fed by gravity from bins built on the sloping west bank. These bins had a capacity of 1,200 cu.yd. and were filled by trucks discharging from the top of the bank. The coarse aggregates and sand flowed by gravity into measuring hoppers, which were regulated by the county inspectors. The concrete discharged into 2 ½-yd. buckets with drop-bottoms. The plant turned out regularly 30 cu.yd. of concrete per hour. The prices do not include excavation, waterproofing, catch basins, lighting conduits, etc. The bridge was designed by the writer under the direction of Frank R. Lander, county engineer. W. H. Baker served as the resident engineer for Cuyahoga County. 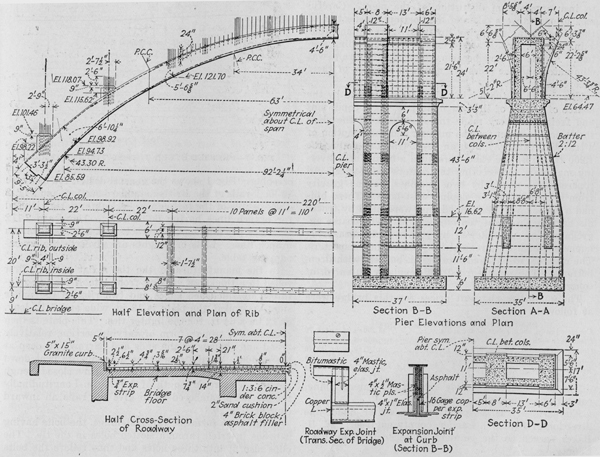 This electronic, World Wide Web edition of the "Modern Bridge in Parkway System of Cleveland, Ohio," by A.M. Felgate, contains the complete text as found in the reprint of the original Engineering News-Record article from 1926. The site is hosted by the Cleveland State University Library and was prepared by civil engineering graduate student Callie Voiklis. © Website copyright 2003 by Cleveland State University. All rights reserved.